This summer was very hot with temperatures usually over 30 degrees Celsius. Because of this hot weather, people felt exhausted and just wanted to stay home. For people like this, The UOS Times recommends going to Seoul Bamdokkaebi (night goblin, in English) Night Market, which opens at night when sun goes down and the breeze blows. 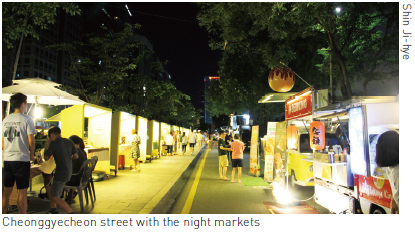 The Seoul Bamdokkaebi Night Market originated from the traditional markets where wholesale and secret sales occur. However, as time has passed, it has been hard to find traditional markets in modern society and the market culture has gradually decrease. 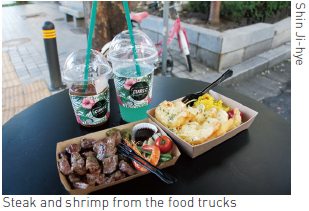 To reverse this trend, Seoul has opened night markets every year, starting with a trial operation in October 2015. Primarily, Seoul created characters and distinctive stories for each place at the night markets and made a cultural festival with clean market places and specialized products. In particular, it attracts young people through a win-win market, which is one of the incubating systems to create a cultural-convergent night market brand. As a result, the number of markets has increased from one to six, the programs have been diversified, and the number of people who visited the markets last year was about 4,940,000. Because of these programs, the Seoul Bamdokkaebi Night Market has become a famous cultural space that many people visit. The Seoul Metropolitan Government has held the Seoul Bamdokkaebi Night Market at various attractions in Seoul; such as Yeouido, Banpo, Dongdaemun Design Plaza (DDP), and Cheonggyecheon. Among these, The UOS Times visited the Cheonggyecheon night market, the closest to the University of Seoul. Take the subway at Cheongnyangni Station (Line 1) and get off at Jonggak Station (Line 1), then go out of exit 5 and walk 80 meters to arrive at the night market. Each place opens at different day and time, but the Cheonggyecheon market is open from 5 p.m. to 10 p.m. on Saturday and 4 p.m. to 9 p.m. on Sunday. Cheonggyecheon night market is the awesome place for watching all parts of traditions of Korea. Visitors can enjoy Korean sights, tastes, and touching handmade souvenirs can be enjoyed. And while walking along the Cheonggyecheon street adorned with cheongsachorong (traditional Korean lanterns, in English), these things recall visitors with happy memories and make them forget about the summer heat. 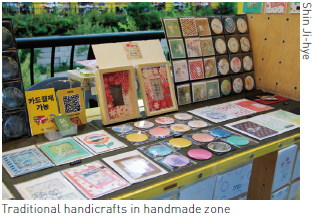 More than 30 handmade products are on display. There are many traditional handicrafts and Hanboks that show the beauty of Korea. Many items are sold on sale, such as rings, necklaces, and some practical items like wallets or dog clothes. Food is a necessary part of any night market. A variety of food and refreshments, from cold beverages to steak, shrimp, and fried potatoes, are sold in about 20 tents listed on both sides of the long roads. Eating freshly cooked food from the food trucks under the yellow tents is especially enjoyable. There are also many tables provided to sit down while eating. The prices vary depending on the food but most are between 5,000 and 10,000 KRW. However, one of the weaknesses of this market is a restricted range of Korean food. The Cheonggyecheon night market tries to show traditional Korean themes but there are only a few examples of Korean food provided. Visitors unfortunately cannot experience all the traditional flavors of Korean food. 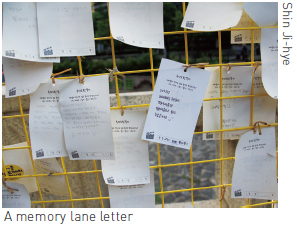 The memory lane program recreates the people and places from the childhoods of Koreans between 30s and 40s. Three programs have been provided for the memory lane project: a memory lane letter, a cup-stacking game, and a coin-playing game. To write a memory lane letter, materials including postcards, pens, and strings are provided at the booths. You can write about memories, dates, and the names of people that you want to meet. Participants can hang the letters on a large board and stand in front of it to recall memories or take pictures. The two games; a coin punch game and a cup-stacking game, will be unfamiliar to young people at first glance, but the rules are easy to understand. The cup-stacking game is just a net-power test that stacks cups before another person by looking at cards that are presented. In this section, singer-songwriters and bands come and perform on stage. Although the artists vary from date to date, causing the atmosphere of the market to differ from day to day, all the performances add vitality to the market and uplift the atmosphere. When The UOS Times visited on July 29, the beautiful sound of an ocarina rang out as the background music of the market. The Seoul Bamdokkaebi Night Market is not only fun but also very meaningful. It has been reborn from the traditional Dokkaebi market into a new place in Seoul that offers new culture, specialized products, and beautiful night views. It is a great experience to visit the Seoul Bamdokkaebi market with family members or friends. It is also fun to go to all the places of the Seoul night markets and experience the different characteristics of each place. However, the opening times and durations may be modified due to the recent heatwave, so be sure to check out the schedules of the markets. For more information, please visit the official website (bamdokkaebi.org) to confirm the schedule on the date you would like to visit one of these wonderful markets.